What Is DD form 2535? DD Form 2535 or the Request for Military Aerial Support is a form used for requesting the participation of U.S. Air Force units in public events within the United States or worldwide. The Department of Defence (DoD) uses the data gathered via the DD 2535 to determine the eligibility for involvement of U.S. Navy Blue Angels, U.S. Air Force Thunderbirds, or U.S. Army Golden Knights demonstration teams in certain eligible events. The latest edition of the form - sometimes incorrectly referred to as the DA Form 2535 - was released in December 2016. A fillable up-to-date DD Form 2535 is available for digital filing or download below or can be found on the Executive Services Directorate website. The form is closely related to the DD Form 2536, Request for Armed Forces Participation in Public Events (Non-Aviation) that is used to request the participation of Army musical units, troops, or equipment in public events. collection of information if it does not display a currently valid OMB control number. PLEASE DO NOT RETURN YOUR FORM TO THE ABOVE ORGANIZATION. RETURN COMPLETED FORM TO THE ADDRESS ON PAGE 4. ALL DATA WILL BE HANDLED ON A "FOR OFFICIAL USE ONLY" BASIS. with the sponsoring organization indicated in Section III to use the event site indicated in 2.c. above. BY THE FLIGHT STANDARDS DISTRICT OFFICE RESPONSIBLE FOR CONTROLLING THE AERIAL ACTIVITIES AT THE EVENT SITE. a. FAA/OTHER GOVERNMENTAL WAIVER IS NOT REQUIRED. c. COORDINATION HAS BEEN ACCOMPLISHED WITH CONTROLLING AIR TRAFFIC CONTROL FACILITY. d. AIR TRAFFIC COORDINATION IS NOT REQUIRED. f. DEMONSTRATION SITE FEASIBILITY STUDY IS NOT REQUIRED. g. NO MAJOR NOISE CONCERNS IN THE REQUESTED AIRSPACE. cannot be accepted by the Department of Defense. DEMONSTRATION CANCELLATION AT THE EXPENSE OF THE SPONSOR. b. PAY TEAM COSTS AS OUTLINED ON PAGE 4, PARAGRAPHS 6 OR 8 OF INSTRUCTIONS, AS APPLICABLE. SITE FOR FLIGHT AND PARACHUTE DEMONSTRATIONS AND STATIC DISPLAY AIRCRAFT. h. PROVIDE TELEPHONE FACILITIES FOR NECESSARY OFFICIAL COMMUNICATIONS AT THE EVENT SITE. i. PROVIDE AERIAL PHOTOGRAPH AND AIRFIELD DIAGRAM UPON REQUEST. 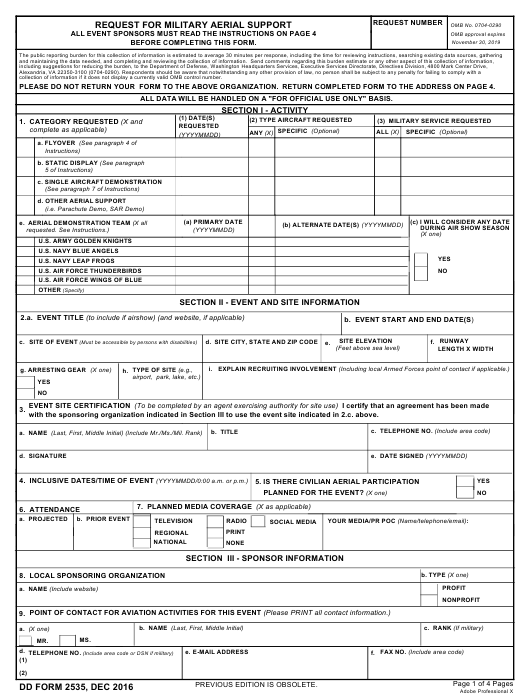 changes to the information on this form may invalidate eligibility for military participation. military organization will only be approved in support of an official installation "open house"
nearest FAA Flight Standards District Office (FSDO) for completion of Section IV. The annual schedule will be released in December of the year prior to the season. may be found at http://www.dmdc.osd.mil/mfh. event site is changed. Previously validated requests will automatically be reconsidered. also require arresting gear located within 80 nautical miles of the demonstration site. to the nearest Flight Standards District Office (FSDO) for completion of Section IV. operations and training programs, and must be at no additional cost to the U.S.
other outdoor events that help connect the public with America's Army and enhance the U.S.
cannot be considered and will be returned to the sponsor's representative. of Section IV. Please send the completed form to the contact listed below. the nearest Flight Standards District Office (FSDO) for completion of Section IV. SPONSOR: PLEASE RETAIN A COPY OF THIS FORM FOR FUTURE REFERENCE. The event sponsors are advised to complete and sign the document digitally before printing it for safety and eligibility reasons. Provide full information about the activity In section I. Describe the specific aircraft or type of requested military troops and provide a description of the particular activities they will need to partake in. Specify the scheduled date of the event. The detailed information about the event goes in Section II. This part of the form provides boxes for the name of the event, its address, site, size, and website (if any). Provide cohesive and complete data about the expected media coverage, attendance, and the certification of the event. Section III requires sponsorship information. Check either yes or no in all boxes with options applicable to your event. Section IV should be completed by the Flight Standards District Office, the organization responsible for control of aerial activities in the area. Section V is reserved for a description of the events' program, including an overview of funds, seating, parking, historical information, etc. For all request other than Flyovers, the sponsor has to complete the corresponding boxes in Section VI. As soon as the event is approved, its sponsor has to contact the provided units to coordinate further participation.